Circa 2E 583, the Court of Bedlam ordered a cultist named Teraniel to strike a deal with the Insatiable. She created an anchor to the realm using an ancient Aldmeri altar in the ruined Vaults of Heinarwe on Summerset Isle, and subsequently summoned the Insatiable to the nearby Cey-Tarn Keep in order to occupy the keep's defenders. The hunger began to hunt and devour the occupants, forcing the Divine Prosecution to seal the keep and begin an investigation. Little progress was made until Silurie, an ex-member of the Divine Prosecution, arrived at the keep and used Stendarran magic she learned in Chorrol to track down the Daedra. Together with the Soulless One and members of the Divine Prosecution, Silurie entered the Gorge and tracked the Insatiable to its lair. It was swiftly banished, although part of the group became trapped within the realm and were captured by Teraniel, who planned to sacrifice them in order to restore the Insatiable. 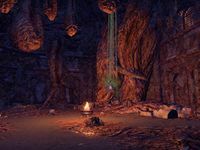 However, the Soulless One located Teraniel's anchor and used it to reenter the Gorge to kill Teraniel and rescue the trapped group members.